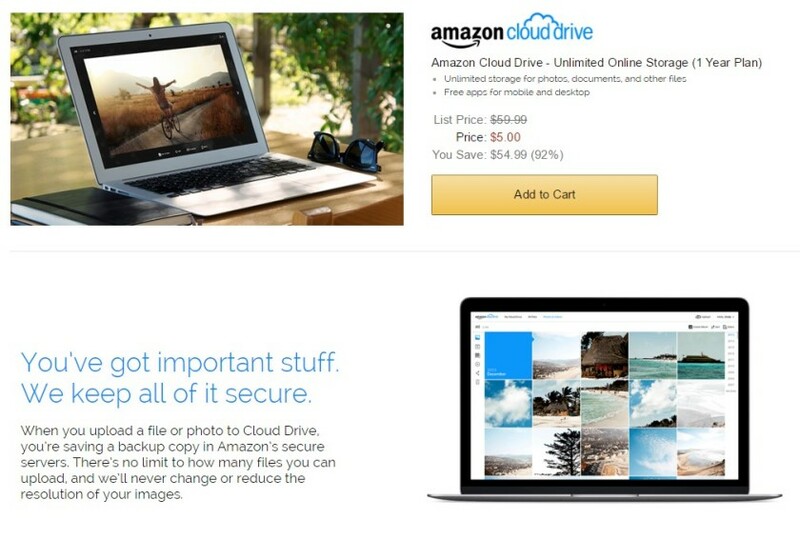 Amazon has a mouth-watering offer on cloud storage - as a part of the Black Friday deals, they are offering unlimited storage. For just $5, one can get one year of unlimited cloud storage, that includes photos, videos, and documents. This price can drop to $1 if the storage will be used only for media. This comes at a time when Microsoft OneDrive storage was downgraded from unlimited to 1 TB. Meanwhile, the free tier gives only 5GB of storage before users are asked to upgrade. In case of Google Drive to store more than 15 GB, users are asked to make payment. The reason given by Microsoft for removing its unlimited storage was that some users were uploading their entire movie collections, among other things, and there-by resulting in 14,000 times more than the amount of space used by an average user. Now let's get back back to Amazon's attractive $5 deal, whose regular price for unlimited storage tier is $54.99. A sweet $50 savings, thanks to this Black Friday deal. In the $1 deal, users are also allowed to upload 15 GB documents apart from the media files. This hot deal will surely get expired soon. So get your hands on it before deal goes out of stock. 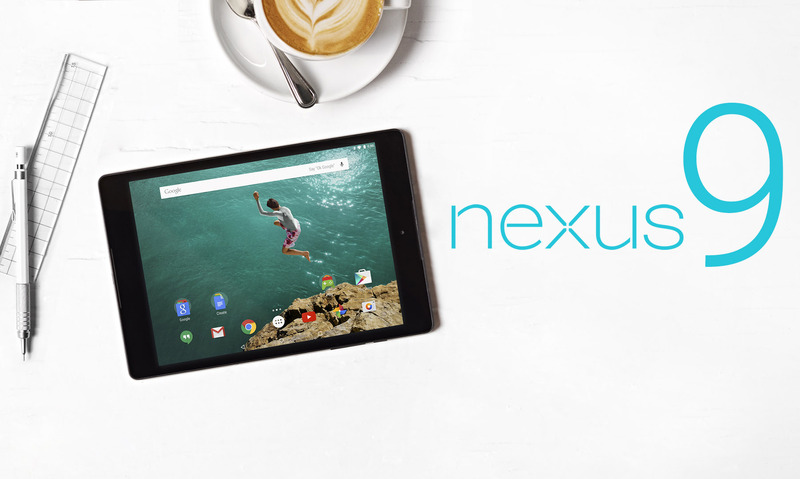 If you can't wait to get the HTC-made Google Nexus 9, you can Pre-order it Now from Amazon. Both colors (Black and White) and both variants (16 GB and 32 GB) are available for Pre-order starting from today. 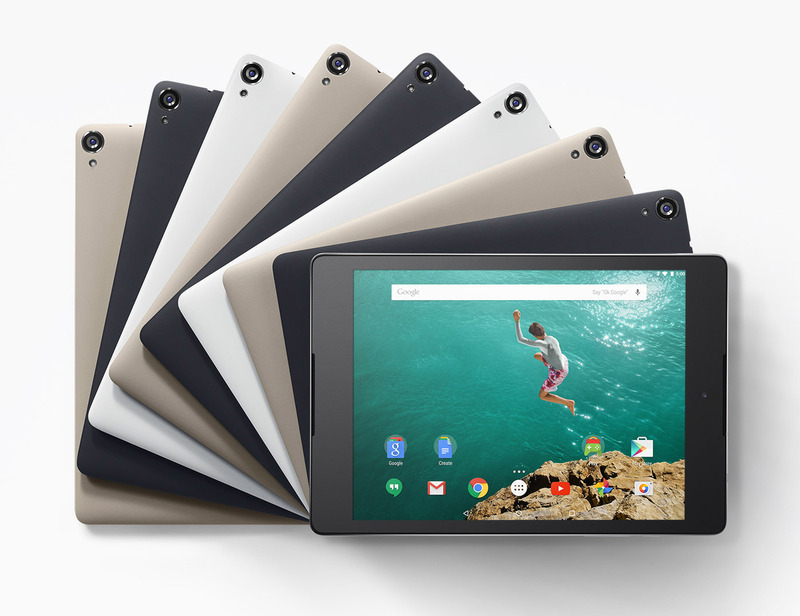 HTC Nexus 9 is priced at $399 for the 16GB variant and $479 for the 32GB variant. It is only available in black and white for now, and NOT the Gold-Sand color. You could choose to get two or three year drops and spills warranty for additional $71.96 and $94.21, respectively. The tablet will be delivered after November,3rd. The Nexus 9 tablet is manufactured by HTC and has a 8.9-inch, 2048×1536 IPS display, 64-bit NVIDIA Tegra K1 SoC, 2GB RAM, 16/32GB capacity, 8 megapixel rear camera, 1.6 megapixel front camera, dual front BoomSound speakers, and Android 5.0 Lollipop. Bad News for UK Google fans, Amazon UK seems to be facing issues with getting the HTC Nexus 9 in stock, the online retailer has just pushed the Nexus 9 shipping date to December,15th. That's a whole month delay... as the tablet was supposed to be released on November,3rd. Naturally, the slate is also offered on the Google Play Store. There, it is listed to start shipping on November 3, so the setback seems to be affecting only Amazon UK for now. There's no information if other retailers in the country are going to delay the Nexus 9 or if the problem is affecting other countries. 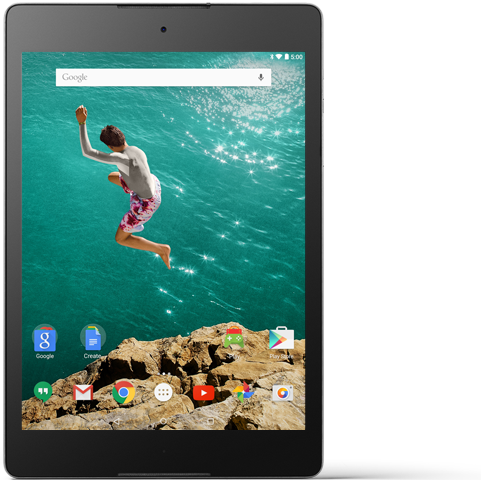 The HTC Nexus 9 Wi-Fi starts at £319 for the 16GB version, and £399 for the 32GB of storage. The Nexus 9 comes with an 8.9-inch 2,048x1,536 touchscreen, an 8 MP rear camera with LED flash, a 1.6 MP front snapper, and it's powered by an Nvidia Tegra K1 chipset, with a 2.3 GHz dual-core CPU. If you're in India, we have some Good News for you. 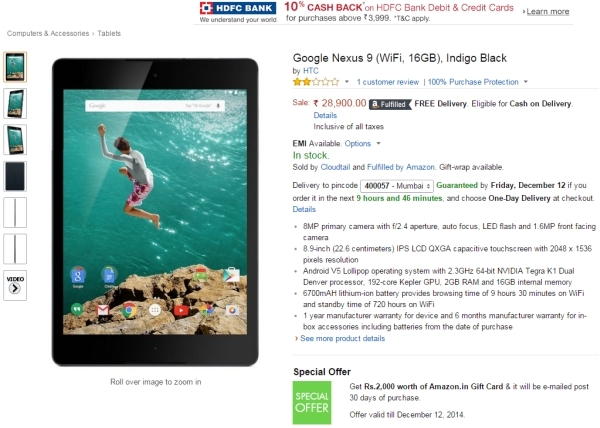 Google just launched the HTC Nexus 9 in India but not on the Play Store... It is Now Available on Amazon. Amazon has only the 16GB WI-Fi model, that too only in the Indigo Black color, so your options are a bit limited. It is priced at the same Rs. 28,900 ($465) as the Play Store. The advantage of ordering from Amazon right now is, one, you can actually order it, and two, you get a Rs. 2,000 gift card from Amazon to spend on their store, along with 10% off for HDFC Bank credit and debit card customers, bringing the effective price down to Rs. 24,010 ($386). Sony released the Xperia Z5 series loaded with top notch features in selected regions across the globe. This variant was not available in the US till now. However, the "Sony Xperia Z5 Premium's" unlocked, international variant can now be purchased via Amazon and Expansys. You should note that the Xperia Z5 Premium available via Amazon and Expansys won't come with U.S. warranty. The retailers have listed both single SIM and dual SIM options of the Z5 handset and both of the variants will support LTE connectivity. But, the handset will work only under AT&T, T-Mobile and other GSM network carriers, as CDMA support is not available. 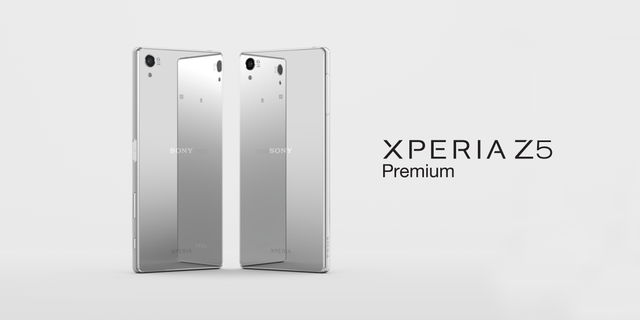 Coming to price, Amazon's Xperia Z5 Premium will cost $733, whereas from Expansys the same can bought for $779.99. The USP of this smartphone is the 4K display resolution of 2160 x 3840 pixels. This device is reportedly the "world's first smartphone" with 4K display. 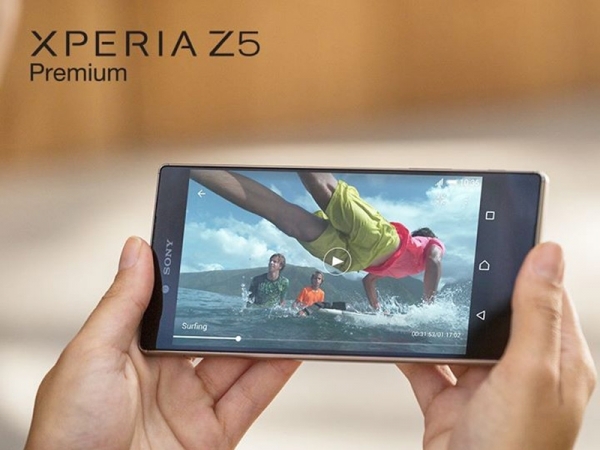 Specifications wise, the Sony Xperia Z5 Premium will boast a 5.5-inch IPS LCD display. The screen size along with 4K resolution translates to a magnificent 806 ppi pixel density resulting in outstanding viewing experience. The device is powered by a Qualcomm Snapdragon 810 processor backed by 3GB RAM. Although currently the OS is Android 5.1.1 Lollipop, it can be upgraded to Marshmallow.